Today I have what I think is my all time favorite mani to this date. I am incredibly happy with this one and I owe it all to my bestie polish friend Sarah at Spellbinding Nails. Her manis are so spectacular that she inspires me to push myself to try and do more and more difficult and intricate designs. If you have never seen her designs you are seriously missing out! I ordered my first actual Konad plate just for this design. I usually refuse to pay for Konad when you can get good replicas cheaper, but for these designs, I wanted the real thing. It was so worth it! This is Orly Pixie Dust, Konad special polish in Royal Purple and Illamasqua Phallic. Phallic. Phallic. Sorry I just love saying that! I saw Pixie Dust on another blog and just had to have it, again just for this design I had in mind. I started with that. Pixie Dust is a greyed out light blue shimmer and absolutely stunning. Of course, the sun chose to hide at this time. Here are your shots. Isn't is pretty? I sure think so. 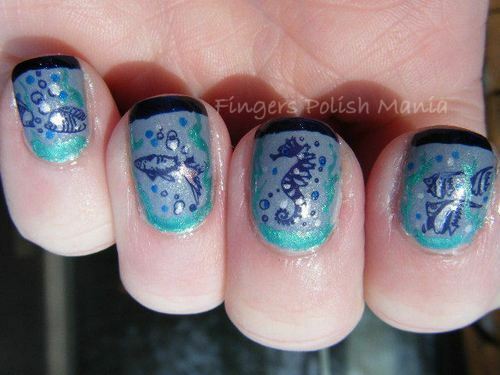 Next I stamped with Royal Purple and Konad plate M27. 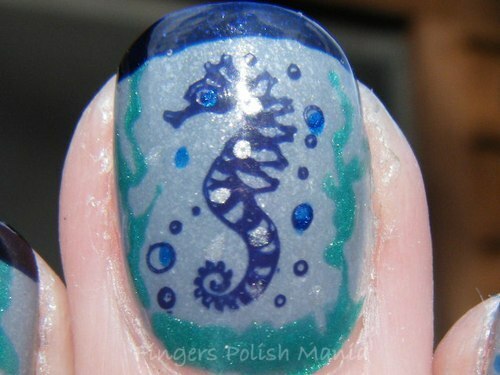 I then added elements to the final design with my nail art pens. I topped it off with my funky french in Phallic. Phallic. Phallic. Here are the glorious results. Isn't this the absolute coolest thing you've ever seen me do? 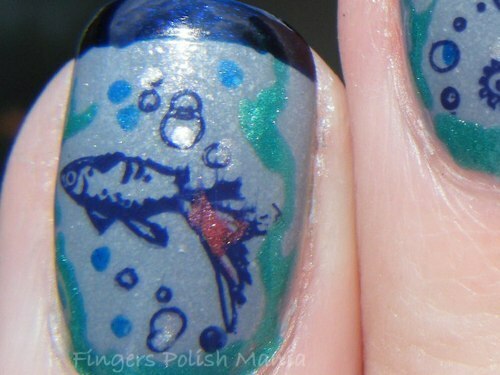 I added the seaweed, some extra bubbles and I was going to color in the fish but felt it would cover up the detail in the stamp itself. So I just added a few little ditzels to the fish. I am a huge aquarium lover. I have visited many all over the East Coast and Chicago. I also own a 30 gallon fish tank with about 20 fish in there. 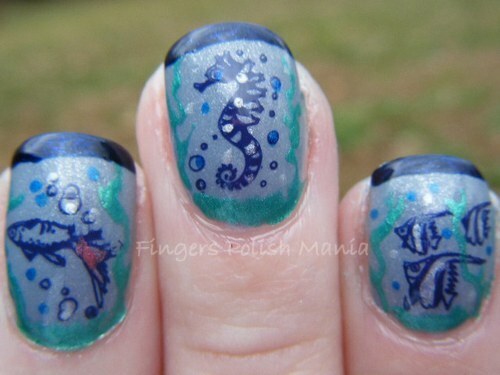 So I have been wanting to try an aquarium mani for awhile now. When I saw that Konad plate, I just knew I had to have it to create this. When I redo my header, this is definitely going to be one of the pictures I use! I showed this around to everyone at work. They were freaking out at this. 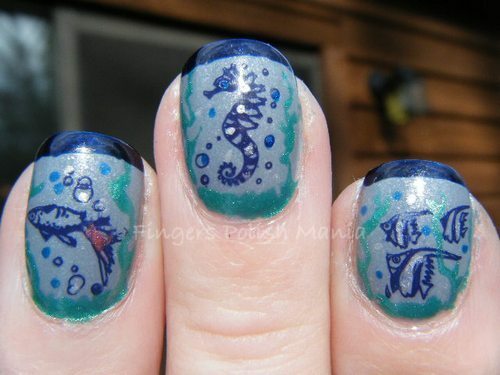 With all my fingers together, it's like an aquarium just like I wanted to do! Ok guys, now your turn. 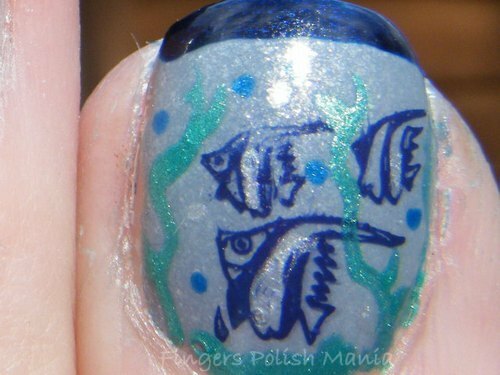 What do you think about this mani?